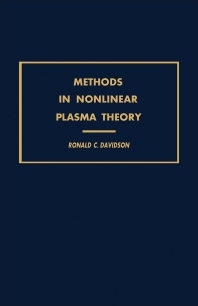 Methods in Nonlinear Plasma Theory is from lectures given in graduate classes in both University of Maryland and University of California at Berkeley. To be able to understand fully the contents in this book, the reader is assumed to be a graduate student with background of classical physics and linear plasma waves and instabilities. This text is divided into two major parts. Part I deals with the coherent nonlinear phenomena, while Part II discusses the turbulent nonlinear phenomena. Six chapters comprise Part I, where basic equations and methods are described and discussed. Some of these methods are Vlasov-Maxwell equations and Korteweg-de Vries equation. Part II meanwhile has eight chapters that discuss frameworks and theories for weak plasma turbulence. Specifically, the weak turbulence theory is presented as it is applied to electromagnetic wave-particle interactions, nonlinear wave-wave interactions, and nonlinear wave-particle interactions. This book is a useful reference for students and researchers in the study of classical physics and plasma theory.